The New York Thruway from Troy to Syracuse spends some time winding by the Mohawk Barge Canal. On an early November morning, the slanting sun lit up mists over the hills and water but in its construction the Thruway allows no stopping points for a photographer to find a picture. So no stopping for a view, just pedal to the metal all the way to Howie Hawkins’s campaign headquarters in Syracuse, where a youthful crew of supporters gathered on a Saturday morning to go out and roust out voters for the Hawkins city council campaign. On the final weekend of the campaign, this was a Get Out the Vote(GOTV) effort. In the morning briefing we were told to ignore 1’s and 5’s, firm supporters and opponents, and work on the 2s, 3s, and 4s, who might yet be persuaded to vote for Howie. 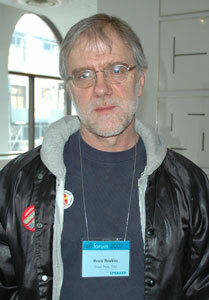 Howie Hawkins is a veteran Green Party candidate. He is perhaps the most experienced not yet elected office seeker on the left. As a Green Party candidate for governor is the last NY election, he managed to get the Green Party on the ballot automatically by getting 60,000 votes, a significant achievement in the locked up game the Democrats and Republicans have created in New York. In so doing he overcame the presence of the Working Families Party(WFP) ballot line, the WFP being an ostensibly“independent” labor backed party that routinely gives Democrats another line. The WFP Democrat was Andrew Cuomo, nemisis of the NY public employees unions. In the current city council election,despite the fact that Howie is backed the CSEA public employees union, the WFP has sent out “volunteers” to campaign for his Democratic opponent. Howie is a working Teamster, member of Local 317, he works at UPS loading trucks on the midnight shift. During the gubernatorial campaign, he managed much of it while working. For the city council campaign he is using two weeks vacation for the final push. At the morning briefing he showed up with his Teamster jacket and jeans, no suit and tie for him. After we were briefed, given clipboards, voter roll info and flyers, it was off to the neighborhoods. In my case, the south side, Howie’s home turf. Largely African-American, the housing is predominately large wood framed single family, formerly prosperous working class single homes showing in many ways the impact of the reamed out upstate NY economy.Abandoned houses dot the streets, with plywood windows staring blankly at the sagging porches of those still occupied. Occasionally a well kept up home pops up, usually with a registered voter aboard. Registered voters are scarce in these parts, reflecting the contradictions of electioneering for radicals, the voting base is older, more conservative and whiter than the overall neighborhood population. Nevertheless, I found lots of friendly faces for Howie, black and white. Notably friendly were many African-American voters, despite the fact that the Democrat Howie faces is black. It was obvious that his previous campaigns and activism had an impact. Persistence has paid off, lawn signs for Howie outnumbered those of his opponent on the streets I walked. In the spattering rain I finished trudging door to door, skipping many, unregistered voters were as frequent in this neighborhood as the abandoned homes. My damp voter sheets flecked with notes, perhaps a dozen new ones for Howie, I walked back to the car, where I used its GPS to find the addresses for those who said they wanted lawn signs. The Occupy discussion grows about the desirability of a new party of the left. Lessons have been learned about the limits of direct democracy, consensus and horizontal organizing. The people I talked to in south Syracuse likely never occupied a public park or participated in a general assembly. Elections give us a way to reach them with a campaign like Howie’s.